Wow!! Seems like a lifetime ago, doesn’t it? I mean, we’re talking last century here!! Recently I’ve been thinking about some of those old sets from the 90’s that used to fuel my collecting fire, and this naturally lead me to revisiting some of the great inserts sets from around that era! In a time when the combining of Baseball cards and Game-Used memorabilia was virtually unheard of, Upper Deck were first to lead the charge when they placed pieces of player’s uniforms into Baseball cards as part of its 1997 Game Jersey insert set, featuring just three stars – Ken Griffey Jr, Tony Gwynn and Rey Ordonez. Seeded at a rate of 1:800 packs this was a TOUGH pull at the time, especially when compared to the 1:24 odds you get in boxes today! However Upper Deck was to push the boat out even further a year later when they created their first Game-Used Bat card set, A Piece of History: 500 Club, which it went on to seed across the whole range of its 1999 Upper Deck Baseball releases! I distinctly remember the furore that this caused at the time as collectors and historians were up in arms that Upper Deck had the audacity to deface what amounted to a national treasure, and to use it as some sort of tawdry Baseball card promotion! The topic of cutting up game-used items from yesteryear continues to be a hotly contested topic, with many believing that such treasures should be left alone for the benefit of future generations of fans. Andrew Harner of Cardboard Mania wrote this great piece a few years ago, Why these cards are bad for the hobby, which examines this very issue and its potential legacy. It’s only a short piece and Andrew makes some excellent points – so go give it a read! The reality behind this particular card was that the bat piece came from a cracked Louisville Slugger used by Ruth in the late 20’s and was picked up by Upper Deck at an auction in 1998 for just over $23,000. Upper Deck never made any excuse for the fact that it was purchased with the single intent of it being cut up and mounted onto trading cards, despite the huge amount of ‘negative’ publicity from the sports media at the time for having the gall to destroy such a priceless (albeit damaged) relic. The ‘500 Home Run Club’ insert set was a huge success for Upper Deck in 1999! The initial set consisted of 15 cards representing the 15 players who had all hit over 500 long balls across their careers, with more being added over the next few years with players such as Griffey Jr, Jim Thome and Manny Ramirez reaching the milestone as well! I’ve had polarised feelings about Game-Used cards over the years. Initially I couldn’t stand them. They felt cheap and worthless… the size of the jersey or bat piece was minuscule and amounted to nothing of any worth. Within a couple of years I did a complete about turn and fully embraced the Game-Used card as an essential, if not a bit gimmicky, part of the sports card experience. After a few years in the card collecting wilderness I returned with indifference towards these types of card. For me now, they are what they are – an additional insert set that adds variety to the sports card product as a whole. The size of the Game-Used piece is still usually too small to have any relevance as a ‘true’ piece of sports memorabilia, and it certainly doesn’t make me feel any ‘closer’ to the player who used it! But as a nicely produced insert set that compliments the master set then it has its place – and I’m fine with that. Give me an on-card autograph though any day of the week!! Despite all this I still can’t help but see the ‘Piece of History: 500 HR Club’ as being one of the most important insert sets ever made and, arguably, one of the very best! A simple classic design with muted sepia tones really add an ‘aged’ feel to the cards and this, coupled with the fantastic range of players on offer, really places this insert set head and shoulders above others of the same ilk. Too see the full range of cards in this set click here to visit the PSA website which shows images of all the cards in their registry that have been submitted for grading. ‹ Previous‘The Wax Fantastic’ Fantasy Baseball League Is Almost Here!!! 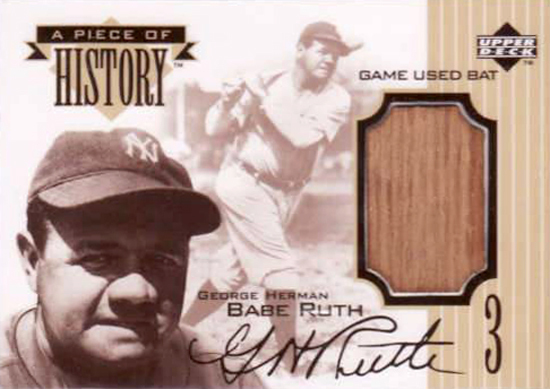 I designed the piece of history Babe Ruth bat card. I insisted we do a photo shoot to document the bat before they cut it up. The VP liked it so much he gave one and it’s in my studio. Lots of good stories from my time at UD. Vincent and myself did all the baseball sets from 1997-2000.